Missed pickups are frustrating, but unfortunately they happen. What happens next? We give our customers the option to have us send the dispatch request, or schedule the pickup themselves. A popular feature for our users is the Print BOL Only option. Once they're ready to quote, book, and print on one end- but on the other the order still needs to be packaged or prepped. This puts them in the driver seat to call the carrier once it is ready. If you see this on your screen, it is our reminder to you that you chose to Print BOL only. If you have verified you have scheduled your pickup you’ll want to check for your pickup number. 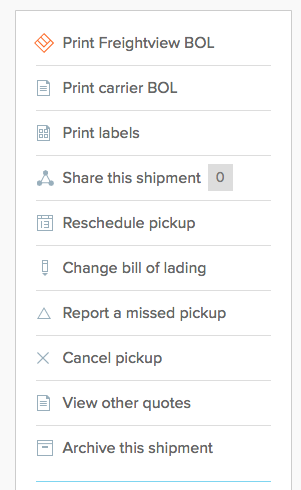 The top of the shipment screen should display a pickup number for most carriers. This is how they verify they have received the pickup. If you see that pickup number that means Freightview has done their part to get your pickup scheduled, and for more information you’ll need to call the carrier and give them that pickup number in reference. We provide their phone number for you on the shipment page. The carrier will be able to tell you why the pickup was missed and allow you to roll the shipment over for to the next business day. What if there is no pickup number? If you don’t see a pickup number, definitely report that to us using the “Report a missed pickup” button on the left hand side of your shipment page. This will generate a new page for you to fill in some information, which will come to our support queue, and from there we will investigate what went wrong and report our findings to you. Schedule all of your pickups in one place using Freightview. Sign up for a free trial today.